Milwaukee Bucks forward Giannis Antetokounmpo was named a starter for the Eastern Conference in the 2017 NBA All-Star Game, the league announced today. Antetokounmpo is the Bucks’ first All-Star since Michael Redd in 2004, and the first starter since Sidney Moncrief in 1986. Antetokounmpo (22 years, 74 days) will become the youngest player in franchise history to start an All-Star Game (Kareem Abdul-Jabbar; 23 years, 271 days) when he takes the floor at the Smoothie King Center in New Orleans on Sunday, Feb. 19 for the 66th NBA All-Star Game. Antetokounmpo is in the midst of a career season that has earned him league-wide recognition and the opportunity to play with the game’s very best at 2017 NBA All-Star Weekend. He is posting career highs in all major offensive categories including points (23.7), rebounds (8.7), assists (5.6), blocks (2.1) and steals (1.8) per game, and is the only player in the NBA this season to be leading his team in each of those categories. He has nine 30-point games this season, after having two in his three previous seasons in the NBA combined, 17 double-doubles and two triple-doubles. Antetokounmpo scored 20+ points in a career-high 14 straight games from Dec. 10 through Jan. 6, and is second in the Eastern Conference behind only LeBron James (19) in games with 25 points, five rebounds and five assists, which he’s done on 15 occasions this season. To celebrate Antetokounmpo’s first All-Star appearance, the Bucks are offering an exclusive ticket package available between now and the team’s final home game before the All-Star break. Fans can get a ticket to any of the Bucks’ six remaining home games before the break, plus an official adidas Giannis Antetokounmpo All-Star T-shirt, for $34 (a savings of as much as $40). 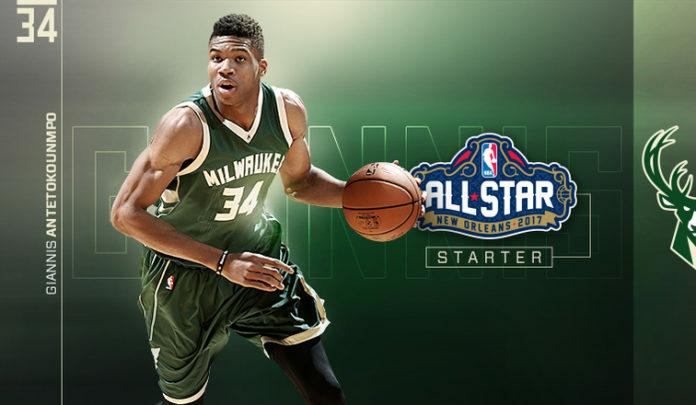 Giannis All-Star packages can be purchased at www.bucks.com/giannis. Antetokounmpo is the 18th All-Star in franchise history and the sixth to be named a starter. Overall, Antetokounmpo’s appearance will be the 40th by a Bucks player in the history of the NBA All-Star game, and the 11th time a Buck has been in the starting lineup. Abdul-Jabbar leads the Bucks in both All-Star appearances (6) and starts (4). Jimmy Butler (CHI) and LeBron James (CLE) will join Antetokounmpo as frontcourt starters, while Kyrie Irving (CLE) and DeMar DeRozan (TOR) will be the backcourt starters for the Eastern Conference. The Western Conference’s starters will be Stephen Curry (GSW), Anthony Davis (NOP), Kevin Durant (GSW), James Harden (HOU) and Kawhi Leonard (SAS). Fans, players and media determined the starters for the 2017 NBA All-Star Game, with fans accounting for 50 percent of the vote and the players and media accounting for 25 percent each. The Eastern Conference and Western Conference All-Star reserves, as selected by NBA head coaches, will be announced on Thursday, Jan. 26.